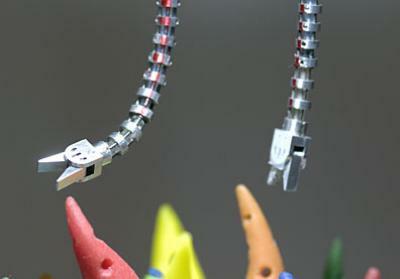 Snake-like robots are under development at Johns Hopkins University for use in throat surgery. The tiny robotic "snakes" have tools at the ends and are fabricated from non-magnetic materials. During surgical procedures, a physician would sit at a workstation showing a three-dimensional view of the site of the operation. Software would control the movement of the robot, following the direction of the doctor. "We want to work in partnership with surgeons to help them do their work more effectively. Human hands are remarkable, but they have limitations. There are times when it would be useful to have a 'third hand,' and we can provide that. Sometimes a surgeon's fingers are too large to work in a small confined space within the body. We can help by building tools that act like unhumanly small and highly dexterous hands." The snakelike robots are highly maneuverable - they can form tight S-curves and have six degrees of freedom. They will help surgeons make incisions and even tie sutures with greater precision. They will require another five years of development and experimentation before use with human patients. I couldn't resist a reference to Doc Ock - Doctor Otto Octavius, the genius who became an archvillain in Spider Man. 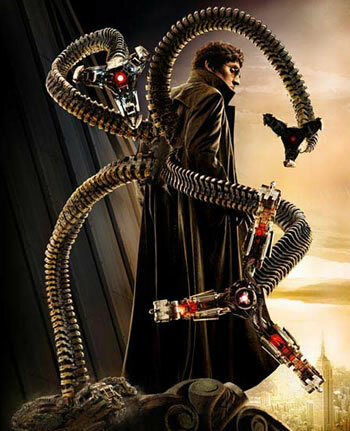 Doc Ock also used his robotic tentacles for scientific experimentation. It's interesting that an optimal solution for moving around in tight spaces has already been found by nature; for the large size version of this same problem, see Snake-Arm Robots From OCRobotics Reach Out and Snake-Arm Robot In A Plane. For an historical perspective, see the encyclopedic Snake Robot Roundup!. Story via Johns Hopkins snake robot press release.